Everydot: North Dakota. Earlier this summer, I drove to and from Minnesota. 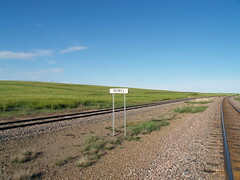 The route passes through North Dakota, of course, and so I had to work on my project of photographing every town in that state. I spent a solid day photographing dots on a diagonal path from Marmarth, North Dakota to Lemmon, South Dakota and North Lemmon, North Dakota. The most challenging dot to photograph was Petrel, North Dakota, which I reached by driving along US 12 in South Dakota, taking a gravel road back into North Dakota, and then walking half mile along a grassy path. The next day turned out rainy, so I headed in the direction of home. On my eastward trip, I’d really hoped to find some big old brick hotel in some downtown where I could get a cheap room with a bathroom down the hall. I knew such a thing had once existed and figured it might still. I saw a brick hotel in Lewistown, Montana, but I didn’t feel much like quitting for the day when it was only 2pm. In Sand Springs, I saw a billboard for the Northern Hotel in Winnett, 44 miles in the opposite direction. I ended up driving to Miles City, since I new there was a big old hotel there, the Olive Hotel. I went to the counter and was delighted to find that they still had rooms available. I was less delighted when I discovered I’d be staying in the Olive Motel across the street. On the way back to Seattle, I passed up an old wooden hotel in Scobey and passed by an old brick hotel in Plentywood that I only now discovered existed. Instead, I ended up a hundred miles down the road in a smoking room an icky 1980s hotel. The next night, however, I ended up at the Ryan Hotel in Wallace, Idaho, purely by chance. It was exactly what I was looking for, and was unrenovated except for the added convenience of a toilet and shower in the room (in place of the next room over’s giant closet perhaps?). Everydot: Douglas County, Washington. 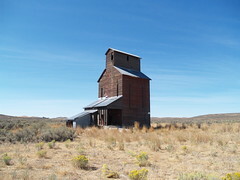 This past weekend, I drove across the Cascades into eastern Washington. I exited I-90 at George, Washington and drove northward. I was again on a search for old brick hotels, and this time I vowed to stop and get a room no matter how early in the day. Early in the evening I hit Waterville and came upon the striking Waterville Hotel. I met Dave and Amy, who run the place, and Dave gave me a tour of the place and directions to Alstown. On the way there, I passed a very dry cemetery surrounded by miles of stubbly fields. The next day, I photographed almost every town in Douglas County. I returned to the Waterville where I sat out on the porch, recalled the day’s adventures, and had some wine and cheese (all of which was a nice change from sitting on a smoky motel bed and eating a microwaved sandwich). Another Secret Crush. Back in April I discovered a 20+ year old Orange Crush bottle inexplicably sitting in a flower box. This weekend, while looking to see if anything remained of Matthiesen, Washington, I found an old garbage dump. 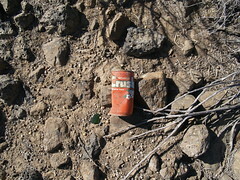 Whoever was dumping their garbage there was a fan of orange soda, and in particular, Orange Crush. I had to grab a fairly well-preserved Crush can just because it was such an odd occurrence. Geodata. On my Douglas County trip, I brought along my old Garmin eTrex Legend handheld GPS unit. I hadn’t done anything with geotagging before, but I figured I’d haul the unit around and see if I could get anything out of it later. Before I left I went to the tracklog menu and saved what was already there, hoping that I might be able to get geodata from past trips where the GPS rode around in my car. A few days after I got back, I decided to pull off the tracklogs. What I ended up with was about 2/3 of my most recent trip timestamped and ready to be synced with my photos, plus the trips I saved (from 2003, as it turns out) sans timestamps. Rather counterintuitively, saving the tracklogs on this unit preserves some data while destroying others. The timestamped tracklogs got synced perfectly thanks to gpsPhoto.pl. Since I’d already uploaded the photos to Flickr, I synced those separately, with GPSTagr. This was great, because I ended up with all the photos I took on a map. Now I wanted to do this for the other 6000+ Everydot photos I’d taken. I figured I’d be able to get geodata for them by connecting the tags I’d put on them with a place name database and adding that via the Flickr API. I downloaded the database from the USGS’s Geographic Names Information Service. For places in Canada, I used Natural Resources Canada’s Geographical Name Search Service. All this was glued together with a Ruby script, and before long, nearly all of my 430 or so Everydots were geotagged. One of my favorite programs on public radio was one from the Australian Broadcasting Corporation called The Comfort Zone, where one could hear “[host] Alan Saunders debate and celebrate the cultural significance of architecture and design, landscape, gardens and food.” I started listening in early 2004, but sadly, its last episode aired on January 22, 2005 and was replaced by a general-interest program with a plan that sounds a lot like APM’s Weekend America. The show archives list lots of past programs I’d love to listen to, but they’re rather hard to come by. The weekly programs were available as a RealAudio streams, some of which I remembered to capture and save before they expired from the site. I checked into getting past programs on CD, but it’s expensive, as most custom-ordered copies of shows and transcripts seem to be. In this case, it’s AU$60.50 per program. Just over two years of programs are available, but that’s over 100 shows, or $6000, well beyond my weekly public radio expenditures. I even checked P2P filesharing networks, but This American Life and Wiretap are hard enough to come by, so it’s not surprising that there’s no Comfort Zone. Maybe some day the ABC will open up and just make old programs available, though I can’t say I’m that optimistic. Perhaps a bit more realistically, maybe they’ll dump more/all of their archives onto some pay service like audible.com. Though it seems less and less likely as time passes, there’s always the chance that a public radio organization in the US might pick up old episodes of the show. For now, however, these shows will molder away somewhere deep in the Australian Broadcasting Corporation archives.